Whenever you experience some serious eyelid problems and symptoms such as high fever, vision issues, painful red or swollen eyelid or eyelid injury, you are advised to seek immediate medical assistance and have your eyes examined. Do not neglect these symptoms, especially if these have been present for a longer period of time. 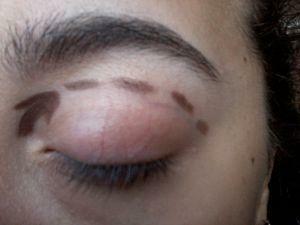 Furthermore, there are many other symptoms which can alert you regarding eyelid symptoms. Read the lines below for more information on the subject. Once your eyelids have been affected by some kind of a health complication, you may experience burning sensations in the eye area. Also, your eyes may produce discharge and you might feel that a foreign object is present in the eye area. Furthermore, excessive tears may appear, bearing witness of eyelid problems. Alternatively, your eye area may become red or warm to the touch and your facial area may swell. Sometimes, usually when the primary symptoms are neglected, the signs of eyelid problems escalate and become life-threatening. Thus, if you happen to notice blunt force trauma to the eyes or the eyelids, as well as the bones around the area, seek medical assistance immediately. Additionally, bulging eyes, high fever, bumps on the eyelids, headaches, vision deterioration and sudden swelling of other facial parts such as the lips or the even the tongue are all signs of serious eyelid problems requiring timely treatment. Our eyelids are very sensitive and, containing numerous blood vessels, they can easily get infected or injured, leading to complications. As far as infections are concerned, allergies, blepharitis, eyelash gland inflammation or inflammation of oil glands near the eyelashes, all are possible culprits. Also, eyelid problems may be triggered by some other underlying health conditions such as allergies, bacterial infections, common cold, conjunctivitis, skin aging, ectropion or entropion, Graves' disease, orbital bone fracture, orbital cellulitis or various types of skin cancer. Once you pay your doctor a visit, he/she is likely to ask you about the first time your symptoms occurred. Additionally, he/she will need to know whether you are taking any medications or are suffering from any of the above mentioned health problems. He/she may ask you if you have been exposed to people with eye infections too or whether you have had eyelid problems in the past. Many other question about your eyelid problem symptoms may be asked and you are advised to provide as many details as possible since the diagnosis and the treatment will rely on the insight you provide. eyelid biopsy showed that I have dense dermal chronic inflammatory cell infiltrate? does yeast infection cause acne on face? And rash around eyes? Are my symptoms related to an anxiety disorder? Are pain or swollen eyelids symptoms of endophthalmitis?